I know it has absolutely nothing to do with the Schweinebraten recipe from yesterday, but I was over on idigmygarden, a really cool forum for gardeners and those on the self-sufficient path, and found this Limoncello recipe. We were recently at our favorite Italian restuarant, Da Enzo, and were served his own extremely tasty homemade Limoncello. I didn’t realize it was so easy to make…and dangerously good. Plus it’s so spring-like here right now that I just wanted to pass on the feeling to anyone who may not be getting that spring rush just yet. 100-proof vodka is best for Limoncello because it has very little flavor of its own. And you want the vodka to absorb as much lemon flavor as possible from the zest. The high alcohol content will also keep the Limoncello from freezing when you chill it in your freezer. It is best served really cold — but seriously, take it easy with the stuff. It tastes a whole lot like lemonade but with a kick-you-in-the-head aftershock. No really; don’t let you kids get a hold of this stuff. The entire process described in this limoncello recipe takes 20-80 days…depending on how patient you are to drink it. Let the limoncello sit for a minimum of 10 days after each group of steps. The longer you let it sit, the more lemon flavor and rich yellow color you will have in your limoncello. You can also get a bit crazy if you want to add vanilla beans to the mixture as it rests. It gives a really nice, smooth flavor that some prefer. They call it “mellocello” which I have to admit is pretty darn fun to say. And I bet it makes you very, very mellow after you drink it. The only difference is that you double the number of lemons you use for zest (30 total) and add 5 vanilla beans. Just split the vanilla beans and scrape the seeds, then add the split beans plus the seeds to the vodka when you put in the lemon zest. The only way I’ve tried limoncello so far is just drinking it very cold as a digestive. But you cold also serve it on the rocks or mix it with a bit of sparkling wine or mineral water with a twist of lemon peel as an aperitif. Limoncello can also be poured over fresh berries or fruit, tossed and served with lemon sorbet. Or just pour a bit of it over vanilla ice cream and enjoy. 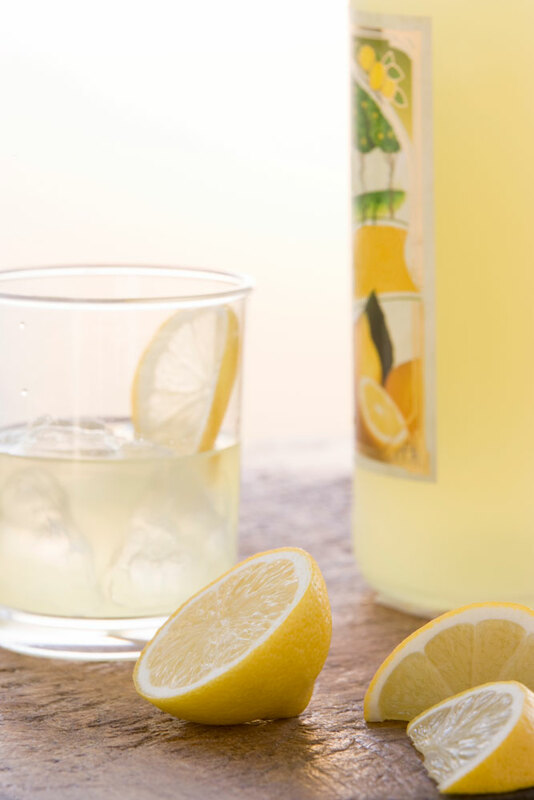 You may notice that the limoncello recipe actually only uses the zest from 15 lemons. So what do you do with all the lemons that you take the zest from?? Make lemonade, sorbet, lemon meringue pie…what would you do with them all? 15 untreated lemons Choose thick-skinned lemons because they are easier to zest. Carefully zest the lemons with a zester or vegetable peeler. Only take the yellow rind part, not the white pith underneath. The pith is very bitter and will spoil the flavor of your limoncello. In a large glass jar (1-gallon jar), pour in one bottle of vodka. Add the lemon zest as it is zested. In a large saucepan, combine the sugar and water; cook until thickened, approximately 5 to 7 minutes. Let the syrup cool before adding it to the limoncello mixture. Add to the limoncello mixture from Step One. Add the additional bottle of vodka. Allow to rest for another 10 to 40 days. After the rest period, strain and bottle: discarding the lemon zest. Keep your bottles of limoncello in the freezer until ready to serve.